Imagine a world where everyone can perfectly understand each other. Language is translated as we speak, and awkward moments of trying to be understood are a thing of the past. This elusive idea is something that developers have been chasing for years. 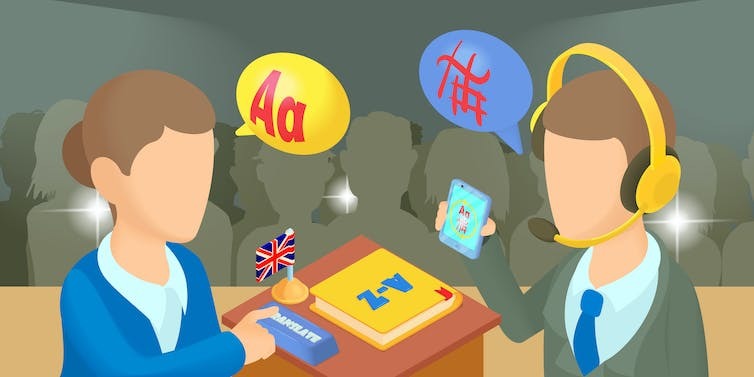 Free tools like Google Translate – which is used to translate over 100 billion words a day – along with other apps and hardware that claim to translate foreign languages as they are spoken are now available, but something is still missing. Yes, you can now buy earpiece technology reminiscent of the Hitchiker’s Guide to the Galaxy babel fish – a bit of kit which claims to so a similar job to that a university-trained, professionally-experienced, multilingual translator – but it’s really not that simple. Despite the rather interesting claim in 1958 that translation is a Roman invention, it’s likely that it has been around as long as the written word, and interpretation even longer. We have evidence of interpreters being employed by ancient civilisations. Greece and Rome were, like many areas of the ancient world, multilingual, and so needed both translators and interpreters. The question of how one should translate is just as old. Roman poet Cicero dictated that a translation ought to be “non verbum de verbo, sed sensum exprimere de sensu” – of expressing not word for word, but sense for sense. This brief trip into the world of theory has one simple purpose: to emphasise that translation is not just about the words, and automating the process of replacing one with another could never be a substitute for human translation. Translation is about the words’ meaning, their connotative as well as their denotative sense, and how to express that meaning in such a way that it is both readable and comprehensible. Why then are we still pursuing this idea that technology could ever begin to adequately translate language? Back in the 1930s, when research into machine translation had just begun, developers still believed that mechanically replacing one word with another, with minimal syntactic reordering at first, would be an acceptable way to translate. And the world still lingers under this impression today. To Weaver, translation was just about ousting one symbol for another. The actual meaning of these “strange symbols” was deemed irrelevant. Translators and translation researchers often read how automation may be the future – some already believe it’s already happened, as it has in so many other fields – but we are nowhere near an infallible technology. There are plenty of examples in Wales alone where non-Welsh speaking people have used online translation services, and published before proof-reading. The results are most often reported with humour, but have undoubtedly led to confusion and a human translator stepping in to solve the problem. But that is not to say that automation doesn’t have its place. Machines, for example, help lawyers, doctors and teachers – they have not replaced them. In the same vein, machines help us translators work better, and can aid accuracy, but unless an incredible technological breakthrough is made, we cannot be replaced by them. Machines have become quite good indeed at translating the text, but when it comes to text-behind-text, they need help. My own thesis into English to Welsh translation – due to be published later this year – shows that a translator working to correct the output from machine translation makes for higher productivity and quicker translation. Further research has also found that this correction process leads to texts that are just as acceptable as translations produced from scratch. In societies like Wales where translation is one of the main ways bilingual services are provided, this productivity growth is all-important. Well over 350,0000 people speak Welsh every day, while local authorities across the UK are also translating into numerous other languages. It is absolutely vital that they are quickly and effectively understood. Today, machine translation can create rough drafts of relatively simple language, and research shows that correcting this draft is usually more efficient than translation from scratch by a human. But machines do not now – and it is questionable whether they ever will be able to – replace a translator’s brain. No matter how complex the code behind it, an automated system would struggle to get the same sense of the words. Technology is beginning to promise ways of remaking neurological connections. Our mood is a transient frame of mind that influences how we think and view the world.